out of Speke airfield. It was the fastest victory of the war. Taking his Hurricane off from Speke, a raiding JU88 crossed the airfield in front of Denys Gillam, who promptly shot it down. It was the fastest air victory of the war, and probably of all time. 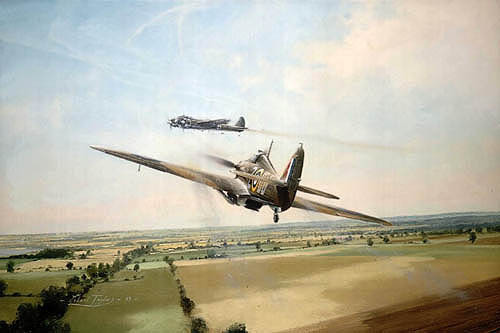 Robert Taylor's painting shows Gillam's Hurricane, guns blazing while undercarriage is still retracting. has captured it just as I remember it happening. Having seen his painting, it seems like it occured yesterday. I take my hat off to the artist"